Mixed hardwood forests and moist rich forests along rivers. Vegetative specimens often cannot be distinguished from smooth-leaved plants of U. americana unless the characteristic corky-ridged bark is present. 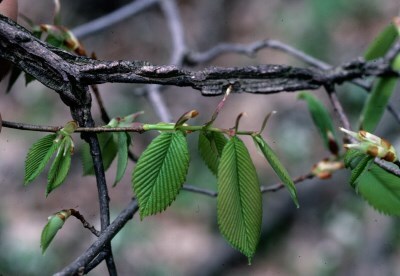 Furthermore, sprout leaves of Rock Elm can be scabrous above. The inflorescence has an elongate axis, almost racemose, whereas the flowers in our other species are more densely clustered. When growing in the open, U. thomasii has a distinctive form with a narrow crown and strongly downturned lower branches. MICHIGAN FLORA ONLINE. A. A. Reznicek, E. G. Voss, & B. S. Walters. February 2011. University of Michigan. Web. April 21, 2019. https://michiganflora.net/species.aspx?id=2752.